The wisewoman or midwife, the good witch who cures all ills with herbal potions, enhanced with a dollop of magic - or not, as the case may be. Willow bark tea and basilicum powder, lemon balm and comfrey roots, they must not be absent from the local herbwoman's inventory. 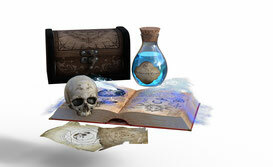 Neither must eye of newt and the occasional bat wing potion, though those are not the topic of this blog. Here, we will focus on medicinal plants which play a role in the real world as well as in fiction. Herbal remedies have a long tradition, having served to cure sickness and injuries long before the advent of antibiotics and other chemically manufactured drugs. Interestingly, as resistances to antibiotics mount and more and more people refuse to accept adverse side effects of chemical drugs as inevitable, phytomedicine has seen a revival in recent years. And, when I can find them, there will be snippets from stories where those herbs are mentioned. I am always on the lookout for more stories that mention herbwomen and their cures, as well as other stories in which herbal medicine is mentioned. If you find such stories, please let me know via my contact form or send me an email. There was a time in my reading career when I devoured every regency romance I could get my hands on. Georgette Heyer is still among my favorite authors. 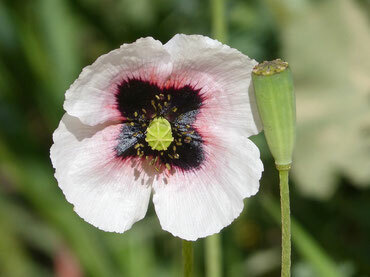 For the longest time, I read about ladies clutching their smelling salts in one hand, and a bottle of laudanum in the other, without ever realizing just what that harmless-seeming potion really was: A tincture made from the juices (latex) gained from unripe breadseed poppy (Papaver somniferum) seeds. I may have been the only person in the world who hadn't known that, but I was fairly astonished to find out that laudanum is nothing other than opium, desolved in strong alcohol. No wonder those high-strung imaginary ladies slept like the dead after taking a dose of their little potion! Opium latex contains a high percentage of morphine, a highly addictive analgesic (pain killer) which acts directly on the central nervous system. It lowers blood pressure and makes the user drowsy as a side effect. 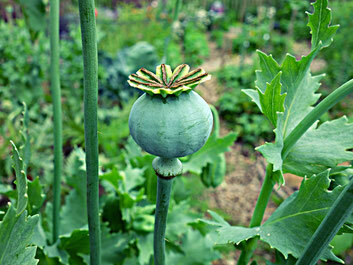 Opium also works against diarrhea, and has a depressant effect on the respiratory system. It is sometimes prescribed as a cough suppressor. An overdose can completely paralyze the lungs, though, so it must be used with extreme caution. In the absence of other, less dangerous analgetics, a conscientious doctor of the regency era might have prescribed laudanum to relieve a severely injured patient's pain, or maybe even to alleviate a strong migraine, as well as to treat severe diarrhea. Taking the drug against a slight headache or to facilitate sleep, however, is nothing other than drug abuse, pure and simple. "You were dreaming," she repeated. "It was just another night terror, Christian. I made you a little posset." He could taste the milk and the spices and the honey on his tongue. He could taste the laudanum, too. Bitter, ugly, and yet after all these years, it still curled around him, whispering that he could have peace. It would be the peace of utter surrender. "No," he said hoarsely. "No possets." Laudanum was discovered in the 16th century by the Swiss-German alchemist Paracelsus, who found that the pain-blocking alkaloids (morphine and codeine, among others) contained in breadseed poppy seeds are soluble in alcohol. He called his alcoholic opium tincture laudanum, possibly as a combination of the Latin words laudare (to praise), and labdanum (a resin from rockrose scrubs, which at the time was used to treat coughs, menstrual problems and rheumatism). Opium tincture, in combination with various other pain-reducing substances, until the end of the 19th century was used as a remedy for a wide variety of symptoms. In the early years of the 20th century, the first efforts at regulating highly addictive drugs were made, and today opium is only used rarely. To this day, though, the drug is sometimes prescribed for severe diarrhea, and its high content of morphine still makes it a potent - if dangerous - analgesic. Today's post will look at the treatment of battle wounds: A topic that often comes up in fantasy novels, and one that our average fictional healer or herbwoman has to deal with on a regular basis. 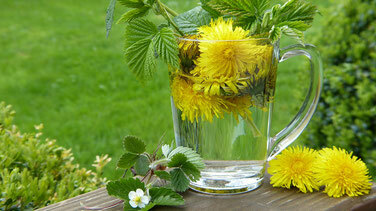 Nature provides a number of remedies that a healer can use to treat wounds. 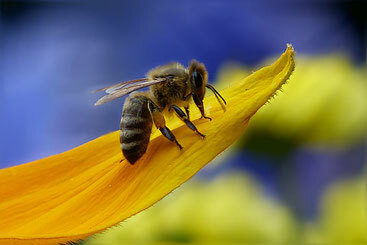 Some examples for such natural medicines are honey, comfrey and yarrow. The woman didn't stir beyond a flutter of her eyelashes when I stitched up a particularly nasty tear over her hip. The worst hurt was a gash in her thigh that was too old to stitch. It would likely cause her trouble long after it healed. I covered it with a salve of fat, honey, yarrow and comfrey that the little fae, who had shyly introduced herself as Haida, had brought back when I asked her if she had such a thing. Honey has a long tradition of being used to treat bacteriogenic infections, and in-vitro studies have found that some honeys are in fact effective against dangerous bacteria, including some antibiotic-resistant strains. There's also some in-vivo evidence that honey works to disinfect wounds and speeds up healing for burns and infected wounds. Comfrey was historically used to support wound healing, since it supports cell growth. 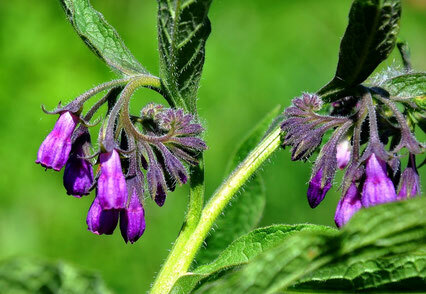 In modern times, its use on open wounds is discouraged unless 99% of the toxic pyrrolizidine alkaloids contained in the plant have been chemically removed from the comfrey extract thus used. It has been scientifically shown that such extracts do have wound-healing and anti-bacterial properties. 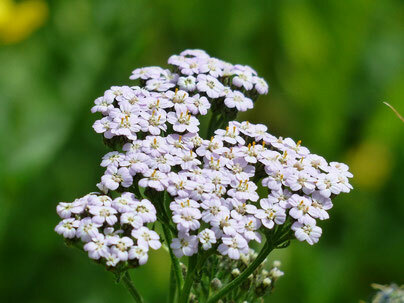 Yarrow, the final ingredient of the salve Samuel is using on the fae woman's wounds, has anti-inflammatory properties and was historically used for wound healing. In modern herbal medicine, it is still being used to treat mild skin and mucous membrane inflammations, though its main area of use these days is the treatment of gastrointestinal problems. Thus, the salve's ingredients give it strong anti-bacterial, anti-inflammatory and wound-healing properties. Given the severity of the wounds Briggs describes in the story, the salve alone would not be enough to save the injured fae woman's life - not in real life, anyway. Since we're talking about a world rife with magic, the herbs may have a more potent effect than they would in the mundane world, though - and the fae woman may survive to thank Samuel for his care. Dear reader, meet Clara the herbwoman: She's the midwife and healer in a rustic little village in the midst of miles and miles of nothing but fields and forests. Winter is drawing to a close, but it's still cold out, and the farmers are starting to ready their tools for the coming planting season. The farmers' hands are roughened by the cold weather, and their skin is starting to chafe and split, even as those hands are needed to do fiddly repairs on tools or to sew new clothes for the coming spring. 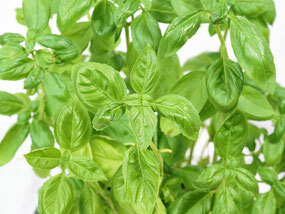 Several bunches of fresh-cut basil, harvested from one of the pots Clara keeps on her window sill all winter. A jar of calendula oil she's prepared by macerating calendula flower petals in sunflower oil, which she's let steep on a shelf by the oven for the last six weeks. Clarified butter that she's rendered from the fresh butter one of her patients has bartered for her services last week. Beeswax from her own beehive out in the kitchen garden. Clara cuts the basil up to free up the essential oil it contained in its leaves. Then she melts the clarified butter and stirs the basil in. For the next half hour, she stirs the butter over slow heat, taking care to never let her concoction get hot enough to bubble. Then she empties the potion through a fine-woven cloth into a glass jar, filtering out and discarding the steeped-out basil. Clara stirs the macerated calendula oil into the still-liquid butter, cuts up some beeswax and stirs that in, too, and heats up the potion in a water bath--still taking care not to let it get too hot--until the wax melts. Once that's done, she decants the potion into small jars and lets it cool until the potion congeals to a soft salve. Tomorrow, she'll have a new batch of healing salve to hand out to her patients. 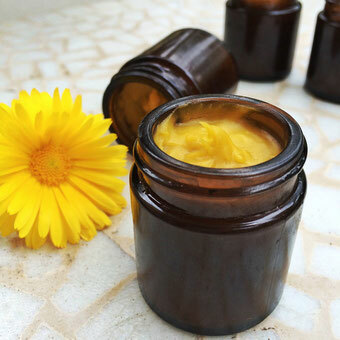 Due to the calendula oil it contains, the potion has anti-inflammatory properties and expedites wound-healing. It also has a mild antimicrobial effect, and inhibits some dermatophytes' growth. Basil is also said to have anti-inflammatory, anti-fungal and antimicrobial effects, and it lends the salve a fresh scent. The clarified butter will be absorbed into the skin and moisturize it, while the wax will provide a protective film on top of Clara's patients' skin, protecting their hands from the cold and dry air. While basil has largely fallen out of use in modern medicine except for folk medicine such as Ayuverda or traditional Chinese medicine, some research exists showing that calendula does indeed help wounds heal faster. 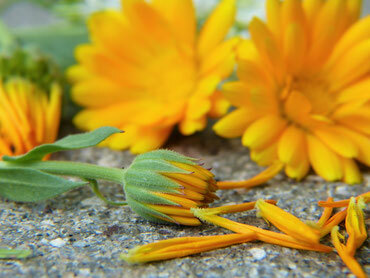 Calendula is also a common ingredient in modern skin care products. Thus, Clara's salve will work in real life as well as for her fictional patients--and in fact, it is a key ingredient in this author's own medicine chest. Her bit of advice had certainly silenced the child anyway; he seemed to be pondering it as they waited for his nose to stop bleeding. When Keisha judged that it had been long enough, she had him sit up and cautiously took the rag away from his nose. There was no further leakage, so she got up and mixed him a quick potion; chamomile for the ache in his eye and nose, mash-mallow and mint to counter any tummy upset from swallowing blood, and honey and allspice to make it into a treat. So will this potion work as Keisha intends? As for soothing an upset stomach - be it from swallowing too much blood or from the tension caused by the fight the boy has been through - the potion will certainly do that. Not only marshmallow and mint, but also chamomile, are all effective remedy for treating stomach upsets and other intestinal problems. Whether chamomile will also help with the boy's aching nose is doubtful, though it does have a calming effect on the psyche, so it might soothe away his upset - and with it, the pain. There are two different plants called chamomile, either of which could be the herb in Keisha's potion: Roman chamomile (Chamaemelum nobile), and German chamomile (Matricaria chamomilla). Both plants contain essential oils, and both can used to alleviate inflammations of the intestinal tract and of the skin. 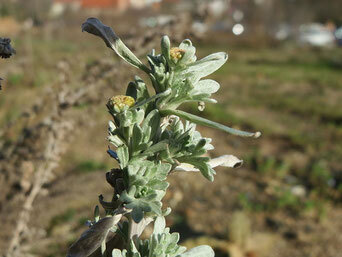 German chamomile (Matricaria chamomilla) is the better-researched herb, though even here, few clinical studies exist. In one study, the essential oil distilled from Matricaria chamomilla flowers applied topically was found to be helpful to reduce the amount of pain killers needed by patients suffering from knee osteoarthritis. It seems likely that this effect stems from the oil's anti-inflammatory properties rather than a direct analgesic effect. It has been shown that chamomile's active ingredients penetrate below the skin surface and can so reach deeper tissue to unfold its anti-inflammatory properties. 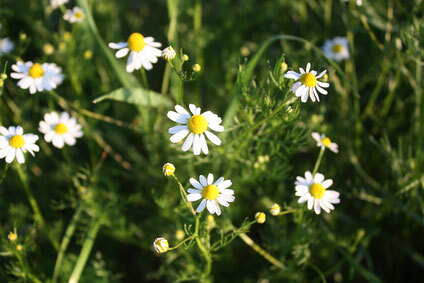 ESCOP has found German chamomile to be effective in treating skin infections, respiratory problems, and cramps and inflammatory diseases of the gastrointestinal tract, but makes no mention of pain relief. But chamomile (both Roman and German) is said to have a slight sedative effect, so the pain-killing effect Keisha expects her potion to have, as mentioned above, is most likely psychological rather than physical. As I've also mentioned above, the potion will certainly be effective to soothe an upset stomach. Not only is chamomile said to work against stomach cramps, but so do the potion's other two ingredients. Marshmallow (Althea officinalis) has proved effective to soothe inflamed mucus membranes such as the stomach lining, and (pepper-) mint calms the stomach's muscles and supports the digestive process. 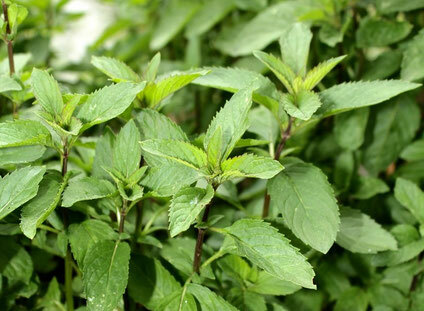 Peppermint can also soothe a tension headache, thus making it a second prong in Keisha's approach to soothe away her young patient's hurts. 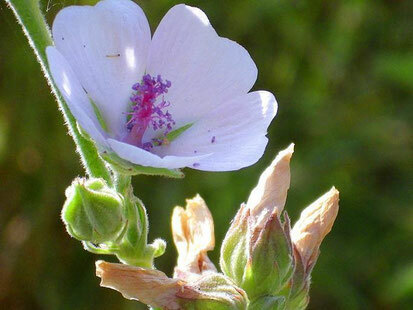 Marshmallow, in addition to soothing the stomach, can also be used to protect the mucosae of the pharynx and larynx, so Keisha might sometimes prescribe the herb for patients with a dry cough as well as for tummy upsets. Chamomile can calm anxieties and heal skin infections, and peppermint soothes away a headache and also has a calming effect. 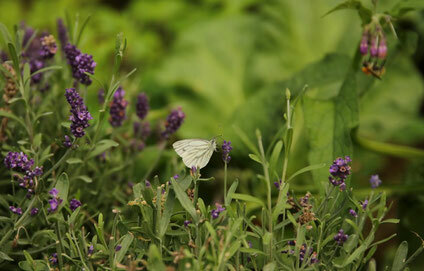 Lavender is a very old household remedy, used for everything from perfuming linen to cleansing the air in a sickroom. The herb contains essential oils, which give it its characteristic fragrance. Lavender essential oil, like most essential oils, has antibiotic and antiviral properties, and it works as an anti-inflammatory and soothing agent when applied to skin injuries and burns. 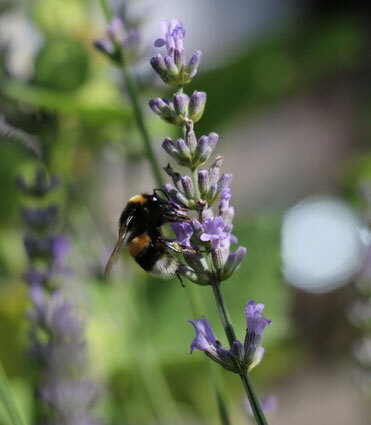 Inhaled, lavender's fragrance can soothe a headache away as well as calm anxieties and promote a good night's sleep. "Do you lie quiet now till I come back, and don't get into the high fidgets, fancying the house will fall down just because you're knocked up with all the trouble you've had, and mean to recruit your strength by staying in bed today, because it won't!" She sprinkled lavender-water lavishly over the pillow, drenched a handkerchief with it, which she tenderly wiped across Miss Wychwood's burning forehead, assured her that she would be as right as a trivet before the cat had time to lick her ear, and hurried away, first to send the page-boy scurrying down the hill with an urgent message to Dr. Tidmarsh, and then to inform Lady Wychwood, who had not yet left her room, that Miss Annis was laid up, and that she had sent for the doctor. "I don't doubt it's nothing worse than the influenza, my lady, but she's in a raging fever!" she said bluntly. The lavender water Lady Annis's nurse is using in this snippet is most likely made from lavender blossoms steeped in boiling water, as described here. The other method of creating lavender water, which is commonly used today, is to distill lavender blossoms and leaves in a process to extract the essential oils contained in the plant. This process yields a by-product, a watery solution of active ingredients other than the essential oils, which has many of the same healing properties as the essential oil, though it does not carry lavender's characteristic fragrance. Lavender water is used in modern hospitals to soothe patients' fears and headaches and to promote sleep. Here is a brief article describing some of the hydrolate's properties. The University of Maryland Medical center states that research has confirmed that lavender produces slight calming, soothing, and sedative effects when its scent is inhaled. Thus, the lavish application of lavender water in the above snippet may soothe away Lady Annis' headache and help her sink into a much-needed healing sleep. Whether it'll also clean the air in the sickroom to protect the patients' visitors from contracting the influenza is doubtful, but in any case, it can't hurt, can it? I narrowed my eyes at the troll and thought, Bring it. The troll, so close that I could feel his breath, stepped on the pavement where I'd dropped the essential oils and staggered back as if he'd hit a wall. There are quite a few sources confirming the effectiveness of St. John's wort against fairies (or the Fae, as they're called in Brigg's Mercy Thompson series), as well as several others that claim the herb as a defense against other magical creatures, or the blights and illnesses they may cause. Usually, though, the herb itself is used, either by ingesting it or by putting a living or dried plant onto window sills or hanging it over a door. Mercy in the above snippet is lucky: The herb's magical properties have apparently survived the distillation process that created the essential oil she's using against her otherworldly attacker. 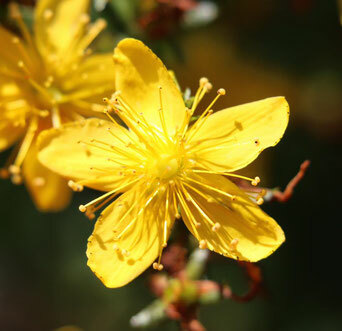 As mentioned above, St. John's wort in modern medicine is best-known for its use as an anti-depressant, though it also has anti-bacterial and anti-inflammatory properties and can be used to treat wounds and burns. 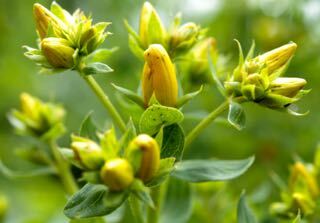 The University of Maryland Medical Center lists the above points as St. John's wort's healing properties, and goes on to state that the herb has also shown promise in treating premenstrual syndrome (PMS), menopause symptoms, and seasonal affective disorder (SAD). The German Kommission E recommends St. John's wort oil extracts for use against wounds and blunt injuries, and also to treat muscle pains. Cochrane found that the herb is an effective antidepressant - but more so in German-speaking countries than in the rest of the world. I won't even attempt to get the the bottom of that particular mystery - I'll leave it you, my readers, to come up with an explanation. And one day, maybe medical science will solve the riddle for us. (*) As for all remedies discussed on this blog, the usual disclaimer applies (see below): Do not try this remedy without your physician's approval. For St. John's wort this is especially important, since depression is a serious illness that should never be treated lightly. Also, the herb interacts dangerously with other anti-depressants, and may render birth control pills and other drugs ineffective. Another invaluable drug in the herbwoman's inventory is the stinging nettle (Urtica). A tea or tincture made from the plants leaves or roots can solve urinary problems and relieve the symptoms of prostate enlargement. 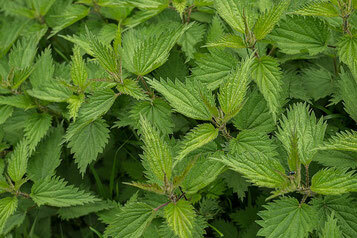 Applied to the skin, the stinging leaves of the nettle counteract arthritis and relieve muscle pains. Nettle leave tea has historically also been used to cleanse the blood of inflammatory agents, and our village healer might prescribe the tea for a purification treatment to relieve joint pains like gout or arthritis. The University of Maryland Medical Center has published a Complementary and Alternative Medicine Guide with a list of medicinal plants and their effects, side effects and interaction with other drugs. The U.S. National Center for Complementary and Integrative Health funds clinical studies on complementary medicines and publishes their results. The European Scientific Cooperative on Phytotherapy (ESCOP) is an umbrella organization representing national herbal medicine or phytotherapy societies across Europe. They collect and analyze case studies about medicinal plants and compose scientific monographs detailing the remedies' effectiveness. The European Medicines Agency has a Committee on Herbal Medicinal Products (HMPC), which discusses possible uses of medicinal plants and publishes its results. The German Kooperation Phytopharmaka publishes scientific articles concerning phytotherapy and compiles information on medicinal plants and their uses. And Wikipedia provides a list of medicinal plants and their uses in traditional medicine. Welcome to the Herbwoman's Arts blog! 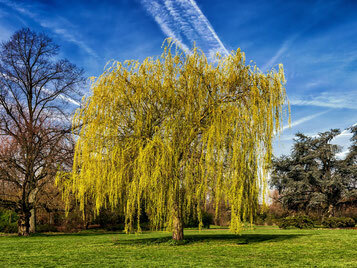 Let's dive right in and start as we intend to continue - with the portrait of a medicinal plant that is quite famous for its healing qualities: The willow. Whether it's a regency romance or a fantacy novel - the willow tree's bark is often found in the pages of a novel. 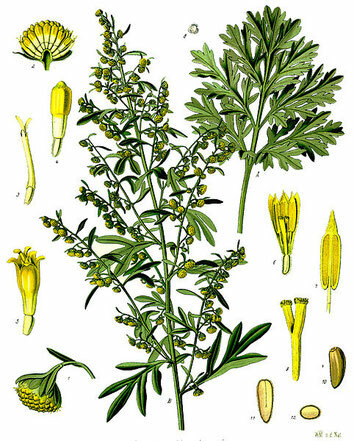 It alleviates fevers and head colds, it cures a headache, and eases rheumatic complaints. In fantasy novels it also serves as a pain killer for superficial battle wounds. It does all those things in real life, too. Willow bark contains salicin, which the body breaks down into salicylic acid when ingested. Salicylic acid in turn is a close relative of acetylsalicylic acid, the main ingredient of aspirin, and has a very similar effect on the human body. In addition to salicin, willow bark contains other, less well-researched substances. The whole cocktail of ingredients combines to an herbal remedy which has most of the positive effects of aspirin without the undesirable side effects its chemically processed sibling causes. Modern phytotherapy uses willow bark extract to treat rheumatic complaints, arthritis, and gout, in addition to its traditional use as a pain killer and for fever reduction. Some studies show willow is as effective as aspirin for reducing pain and inflammation (but not fever), and at a much lower dose. 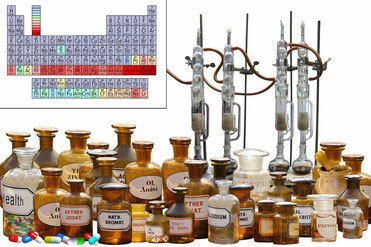 Scientists think that may be due to other compounds in the herb. More research is needed. In other words, willow bark tea (or willow bark tincture) is a very effective headache potion. It also works as an anti-inflammatory agent and has some antipyretic (fever-reducing) effect - for example when treating wounds in the aftermath of a battle, as a human physician in the following snippet is called on to do for an injured Fae lady. "I can't do much," I told the creature. "I don't have the supplies. I can clean the wounds and stop the bleeding and give her the chance to heal. She needs to be somewhere out of the weather. There is snow coming." "There is shelter." She bobbed her head. "And we have needles and thread. What else do you need?" "Honey," I told her. "Willow bark. Water. How far away is the shelter?" "Well, my back had been bothering me for a while," she replied with obvious reluctance, "but I never really thought about it. [..]"
She grunted, and the skin of her neck reddened a little. "I don't like to whine about things," she said. "Especially not things I can't change. So I kept my mouth shut and drank a lot of willow. 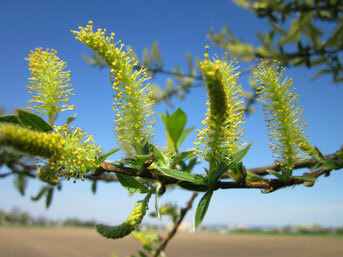 [..]"
The willow's bark is collected in spring when the tree is in growth. Branches between two and four years old yield the best bark, which is stripped off and then dried in a warm room. Any willow tree will do, since salicin occurs in all subspecies. The bark can be brewed up as a tea, or preserved in alcohol and consumed as a tincture. (*) Please do not try this at home! are safe to try out without professional supervision by a physician.